A former Amazon employee is holding a "protest vigil" outside of its Seattle headquarters, vowing to stay there for at least six hours a day until the company addresses his concerns about its alleged "culture of dishonesty" and "deceptive and fraudulent" business practices. Kivin Varghese, who's engaged in a case against Amazon for wrongful termination, outlines his grievances in a public letter to Amazon's board and officers and CEO Jeff Bezos. He's been protesting for the last week. Varghese sued Amazon in 2012 following his termination after seven months on the job. Although he won part of his case in July 2013 - Amazon waived enforcement of an 18-month non-compete obligation and granted him all rights to a patent application he'd filed - the trial for the second part of the suit has been pushed back until March 2015. Varghese, frustrated by the drawn-out legal process, wants to draw attention to his case and his allegations against Amazon, which we first saw on Geekwire. 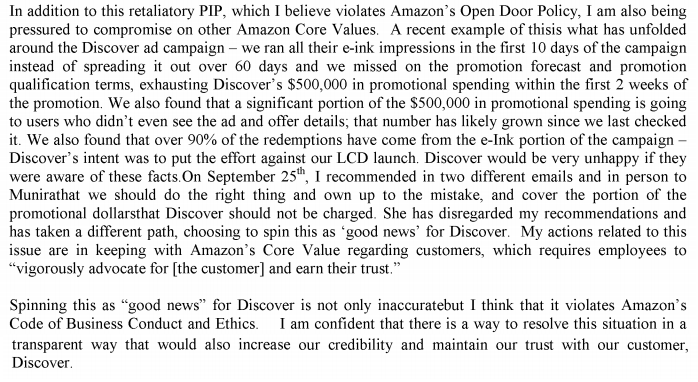 In the suit as well as in his recent letter, Varghese accuses his former manager of purposely misleading a big advertising customer, Discover, about the mis-use of hundreds of thousands of its dollars on a Kindle advertising campaign. He also alleges that he was fired in retaliation for filing an ethics complaint about the issue and also "going over the head" of his manager to report other serious software problems that he alleges would have negatively impacted the Kindle Fire ad platform. Amazon hired Varghese in March 2012 to work on its Kindle ad platform. When he got the job, Varghese thought he would be working on the platform for Amazon's Kindle e-reader, but learned afterwards that the company wanted him to focus on the confidential launch of its first Kindle Fire tablet. A few weeks prior to that release, Varghese says he noticed that it was taking 3-5 seconds for the Kindle's advertising app to load advertiser's custom landing pages. He brought the latency issue up with his manager, Munira Rahemtulla, and VP Paul Kotas, who he alleges deemed it "within acceptable norms." Despite this guidance, Varghese alleges that the tech team designated to work on the product said it was too late to fix the issue, and that they would address it in a post-launch software update. He alleges that Rahemtulla didn't press the team hard enough to get the fix done before launch. So, Varghese decided to escalate the issue himself by emailing Blackburn directly expressing his own concerns that not fixing the latency issue would cause Amazon to risk losing "both advertisers and consumers." Soon after sending his note, Varghese alleges that Rahemtulla sent him an email saying she was "embarrassed" by his email to the SVP and that he should "never escalate issues to Jeff Blackburn." Varghese maintains Amazon's open-door policy encourages employees to bring comments and concerns directly to management teams. Rahemtulla's perspective was that Varghese shouldn't have sent an email that she says came across as asking for help without having put together a plan and a potential solution beforehand. Ultimately, the latency problem was solved before launch. Varghese alleges, however, that this exchange marked a turning point in his and Rahemtulla's relationship (one which he alleges ultimately factored into to his termination from Amazon). Because Varghese felt that Rahemtulla was retaliating against him with negative feedback for going over her head, he talked to HR about transferring to another team where he would work under a new manager. Varghese was told he could not transfer because Rahemtulla had put him on a "Performance Improvement Plan" (PIP) which automatically prevents transfer for 12 months. (In its response to Varghese's suit, Amazon says that it usually requires employees to have worked for 12 months before being eligible for an internal transfer, anyway.) He alleges that Rahemtulla only enacted the PIP because she was unhappy about how he had handled the latency issue; Amazon says that Rahemtulla felt Varghese should have owned the issue and attempted to find a solution to the problem himself. Varghese says another major issue followed soon after the successful launch of the new Kindle and Kindle Fire tablets that caused him to question Rahemtulla's ethics and eventually file an ethics complaint against her. The problem came from Amazon's partnership with Discover Card. Discover was one of Amazon's launch partners for the new Kindle devices. The company ran a promotion where Discover could pay an extra $500,000 to participate in a program that was supposed to give a $10 Amazon gift card to any Kindle customer who made Discover card their default 1-click card and then bought a digital good, like a song, book, or movie. The finance and ad execution teams estimated that Discover's $500,000 investment would last for the full 60 days of the promotion. Then, only 10 days in, over $300,000 was gone. The problem: Customers who already had Discover as their 1-click default were getting the $10 gift card too after buying a digital good, even though they were never seeing Discover's ad. 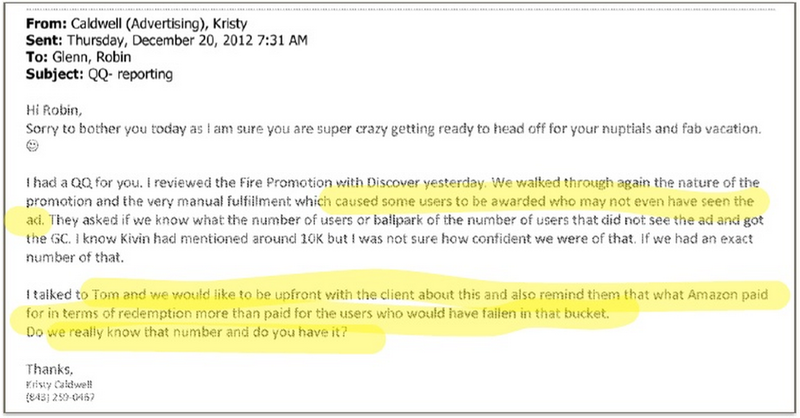 Discover was essentially paying $10 to tens of thousands of users who didn't even know about the promotion. Varghese and Rahemtulla disagreed about how to handle the situation. Amazon changed the terms and conditions of the promo so that customers would have to interact with the ad to get the gift card. Amazon stopped running the campaign on Kindle e-readers but continued running the campaign on the Fire tablets, and covered the cost of the additional promo funding. 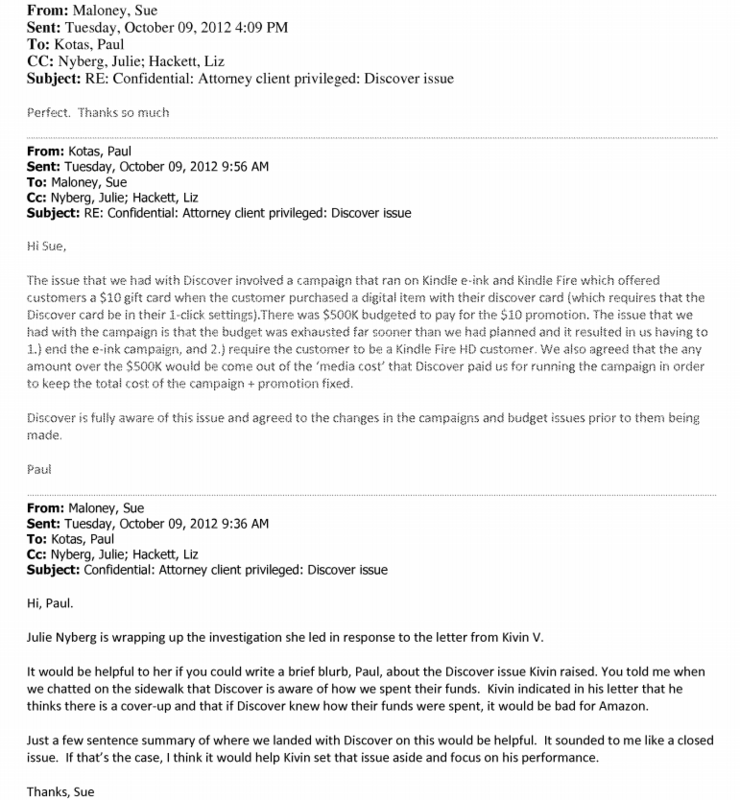 Varghese alleges Discover paid the full $500,000 (Discover declined to comment on this piece). 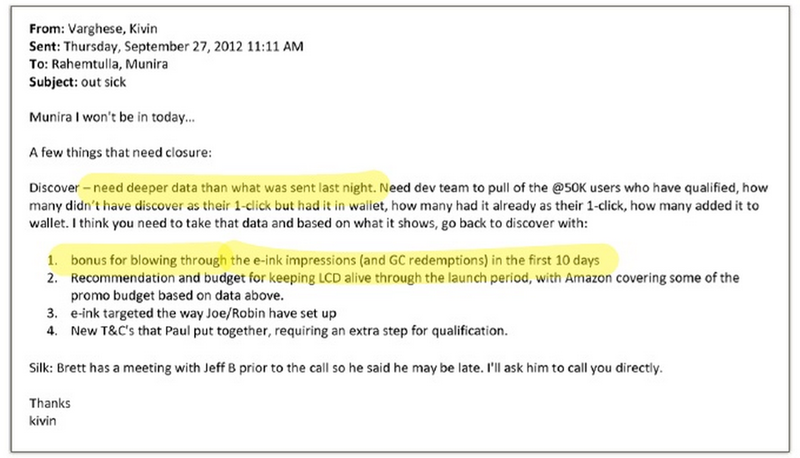 Amazon responded to that email with a number that Varghese alleges was incorrect. Varghese also believes Discover should know the break-down of how many people actually made Discover cards their default-card during the promotion period. Also, Discover originally wanted 70% of its impressions to come from the Fire tablet and 30% to come from the e-reader. 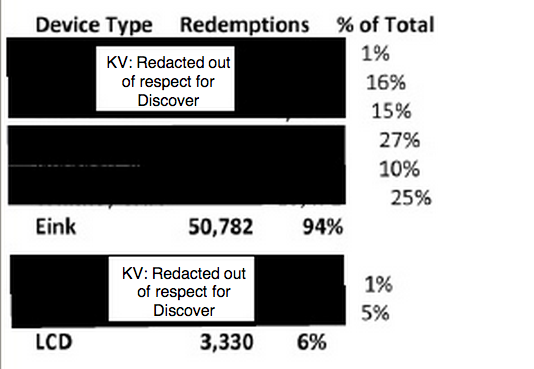 Varghese alleges that Discover was never given the actual break-down (at right), but Discover declined to discuss this case. 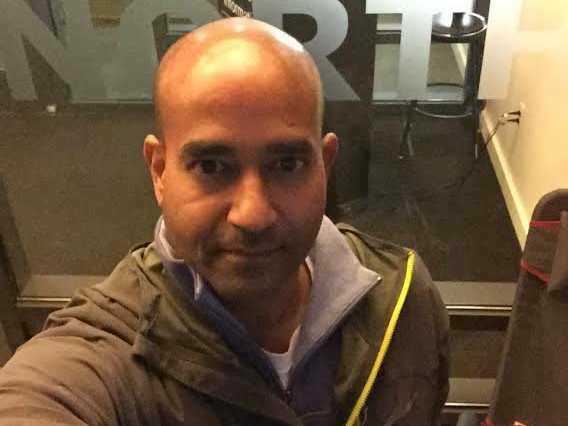 Varghese filed an ethics complaint about the handling of the situation with Discover and the way that Rahemtulla reacted after he escalated a latency issue. Amazon conducted an in-house investigation after Varghese filed his complaint and concluded that there was "no violation of Amazon's anti-harassment policy or Code of Ethics." Varghese tells Business Insider that he's planting himself outside Amazon's headquarters because he considers himself a victim of a system that encourages managers to play down product problems, cover up mistakes, and punish people who speak out. Varghese also alleges that his manager Rahemtulla lied about her degree on the resume that she submitted to Amazon. Varghese has been camping out in front of Amazon since November 5 and plans on continuing his protest indefinitely. "There are some real issues that I hope get addressed, not just for me but for other employees at the company and for customers," he says. "It's just not right what happened, and unless someone stands up to fix it, it will never be fixed." Varghese says he's recieved "thank you's" and "keep it up's" from Amazon employees who pass him on their way into the Day One North building he's stationed in front of. "I'm sick of it, and I'm going to stay here and be here every day until Jeff fixes the issue," he says. "Because I think these are issues that cut to the heart of the culture of the company." Business Insider reached out to Amazon and Discover, neither commented. Read Varghese full letter here.